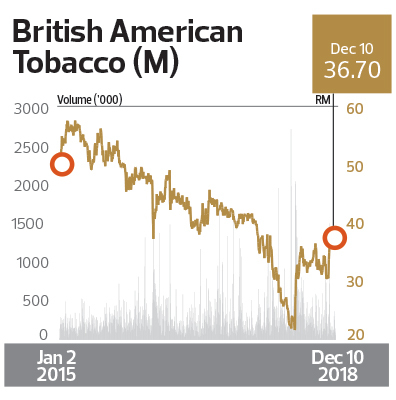 "HIGHEST RETURN ON EQUITY OVER THREE YEARS: CONSUMER PRODUCTS & SERVICES: British American Tobacco (M) Bhd - Stellar Return On Equity Despite Earnings Pressure | The Edge Billion Ringgit Club 2018"
British American Tobacco (M) Bhd (BAT)has seen rough times over the last few years. With the pressure of ever-increasing excise duty and the constant battle with illegal cigarettes, it decided to close down its production plant in Petaling Jaya in June last year. To rub salt into the wound, the counter was relegated from the FBM KLCI in December 2017 after a semi-annual review by Bursa Malaysia. Its share price fell to an all-time low of RM21.72 on May 7, a far cry from as high as RM59.85 on Dec 1, 2014. The tobacco player’s earnings have declined in recent years. Its net profit fell to RM492.6 million in FY2017 from RM902 million in FY2014, reflecting a three-year average annual decline of 18.3%. Despite the challenging circumstances, BAT outshone its peers in the consumer products and services sector by coming up on top in terms of return on equity over three years. The weighted three-year compound annual growth rate of BAT’s ROE between FY2014 and FY2017 was over 120%. In its FY2017 annual report, managing director Erik Stoel says the legal tobacco market has yet to recover from the steep increase in excise duty of close to 40% in November 2015. Nevertheless, BAT remains the market leader in the tobacco industry, commanding a market share of 53.8% of the legal market as at end-2017. Its product portfolio ranges from the premium to the value-for-money segments, with brands such as Dunhill, Pall Mall, Peter Stuyvesant, Benson & Hedges, Kent and the recently added Rothmans, which is in the economy category. BAT is aware that the road ahead remains challenging, with illegal cigarette trade dominating close to 60% of the market. The company highlights that the escalating illegal cigarette trade in the country is a result of the absence of a national enforcement agenda or a clear pragmatic alternative solution to address the issue. “We believe this is required against the backdrop of a challenging economic environment and poor consumer sentiment that is impacting not only the tobacco industry but also many other fast-moving consumer goods companies and the retail sector,” it says in its annual report. BAT also says it remains committed to cooperating with the government in providing alternative solutions to solve the issue of illegal cigarette trade. “We look forward to the government’s increased commitment to eradicate the illegal cigarette trade to sustain and grow employment, investments, shareholder return, government tax revenue and eliminate under-aged tobacco consumption,” it adds. While the illegal cigarette trade is a persisting problem for the industry, the various taxes imposed also continue to put a strain on the tobacco player. With the implementation of the Sales and Services Tax, which replaced the Goods and Services Tax on Sept 1, BAT announced that it has no choice but to increase cigarette prices. “For the tobacco industry, a sales tax of 10% is higher than the previous 6% GST. Furthermore, this implies a double taxation as the SST will be levied inclusive of the high levels of excise, which we currently contribute to the government. Unfortunately, this will leave us no other choice but to consider an increase of the consumer price to reduce the estimated negative impact on our business performance and to compensate for the differential in tax between SST and GST,” Stoel says in a press statement. BAT, which absorbed SST in September and October while awaiting regulatory guidance on pricing following the 10% SST implementation, had on Nov 2 raised cigarette prices by 40 sen per pack, or a 2% to 3% increase in retail price. Now that the product pricing uncertainty has been cleared, analysts are looking out for signs of the company and its peers benefiting from the government’s pledge of better enforcement against the illicit market, which does not pay taxes and hence is a loss of revenue for the government. At the time of writing, BAT was hovering at RM36.70 per share, which reflected a yield of 4%, Bloomberg data showed. Yet, even the most bullish of analysts covering the counter only valued it at RM40.35 per share while the most bearish valuation was RM27.39. There were seven “buy”, four “sell” and seven “hold” recommendations, with the consensus target price at RM33.72. Only time will tell if BAT will triumph over the pressures of higher taxes and the illegal market trade.